Paris will assist Greece with “anything” to lessen its debt burden, except for writing it off, France's finance minister told Syriza-appointed Yanis Varoufakis, who is touring Europe seeking support after Athens vowed to go “cold turkey” on debt. 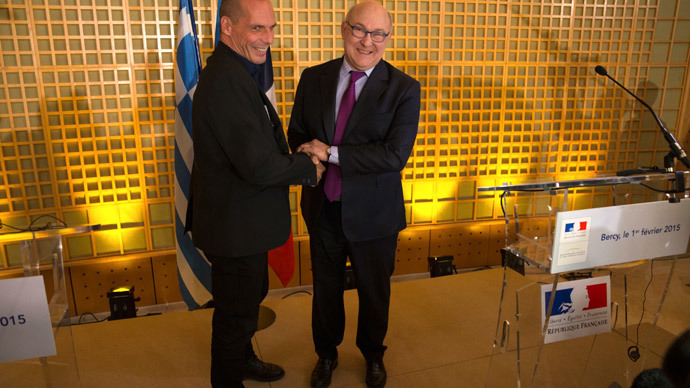 “Anything that can alleviate the Greek debt burden will be welcome,” French Finance Minister Michel Sapin said at a media conference in Paris after the two socialist politicians walked hand-in-hand in front of the flashing cameras. At the same time, the French minister said there is “no question” of canceling Greece's debt – which stands at about €315 billion (US$356 billion), or 175 percent of the country’s GDP. He noted that Varoufakis “understood” that any costs in that scenario would simply be “shifted” from the Greek taxpayers to those elsewhere in the EU. Sapin also promised that France would help Greece – which has one of the lowest tax collection rates in the Western world – reform its tax system. “This will help restore Greece's credibility and fiscal balance,” assured the French politician. In turn, the Greek minister said that his country – which has barely been balancing the budget, even under the austerity regime of the previous government – will not borrow more money for the foreseeable future. A charismatic Greek-Australian academic with no previous experience in frontline politics, Varoufakis is seeking a roughly 50 percent haircut on Greece's so-called “bailout debt,” which currently stands at €240 billion ($271 billion). The rescue that Greece now wants to renegotiate was opened back in 2010, in order to restructure the country’s debts and avoid a financial meltdown. Athens needs until the end of the month to prepare its initial proposals, Varoufakis said. Reaching a realistic agreement could take another six weeks, he added. Varoufakis’ strategy has been to avoid negotiations with the Troika – the European Central Bank (ECB), European Commission (EC), and the International Monetary Fund (IMF) – which has overseen previous Greek bailout tranches, and has demanded structural reforms in return for more funds. After meeting with US Secretary of the Treasury Jack Lew, Varoufakis will now travel to London, and then onto Rome. He is also eager to “soon” visit Berlin, where he faces the stiffest test from German politicians who do not want to disappoint an electorate which demands that no more concessions are made to Greece.